The Facebook IPO gets closer and I don’t think I can put off this valuation much longer. While we don’t have an offering price yet, the preliminary estimates are that the company will be valued somewhere between $75 billion and $100 billion. As with my Skype, Linkedin and Groupon valuations, I will present my assumptions and valuation of Facebook, with the admission that I have no crystal ball and know that your estimates will be very different from mine. So, with that disclaimer out of the way, here are my valuation assumptions for Facebook. (a) Revenues in 2011 were $3,711 million, up 88% from revenues of $1,974 million in 2010, which, in turn, were up 150% from revenue of $777 million in 2009. (b) The firm's pre-tax operating income increased from $1,032 million in 2010 to $1,756 million in 2011. The firm's net income increased from $ 606 million in 2010 to $ 1 billion in 2011, though a third of that net income was set aside for participating securities (convertible preferred and restricted stock units... More on that later...). Incidentally, Facebook paid 41% of its taxable income as taxes in 2011. (c) The company is primarily equity funded and its book value of equity at the end of 2011 was $5,228 million; the only debt on the books was $398 million in capital leases. They did have operating lease commitments, which when capitalized yielded a value of $776 million. The total debt is therefor $1,174 million. Since advertising revenues are the drivers of both firms' growth engines, and they may very well be competing for the same advertising dollars, I think a comparison of their competitive advantages is in order. Facebook's primary advantage is that they can use what they know about their users (which is a lot... scary thought!) to offer focused advertising. Google's advantage is that it has a more direct and easy business model, since its revenues come from user clicks. In contrast, Facebook has to be careful about making its focused advertising too obvious, since some users will find this creepy. Google has added other products to its mix, with the Android as the most prominent example, and Facebook also has potential avenues for expansion. 4. Reinvestment: In one of a series of posts on growth, I argued that growth does not come free (or even cheap). That is true for even a company with the pedigree of Facebook. There is some information in the financial statements about reinvestment: the company had net capital expenditures of $ 283 million, an acquisition that cost $24 million and an increase in capital leases of about $ 480 million. To estimate reinvestment in future years, I assumed that the firm would be able to generate about $1.5 million in revenues for every million in additional capital investment. At this stage, it is impossible to tell what form the reinvestment may take, but looking at Google over the last few years should provide clues; the company has moved increasingly to using acquisitions to augment growth. Lest you feel that I am being too conservative, I am estimating that Facebook will generate a return on its capital of about 32% in year 10, up from just over 26% now. 5. Risk and cost of capital: Facebook is a company that is funded almost entirely with equity and while it is a young, growth company, it does have a business model that is working and delivering substantial profits. While we can start from the bottom and work up to a cost of capital, using parameters estimated for Facebook, I will employ a far simpler approach. Looking across the costs of capital of all US companies at the start of 2012 (you can find this on my website), I estimate a cost of capital of 11.42% for advertising companies. I will assume that Facebook will face a similar cost of capital to start. The median cost of capital for US companies is roughly 8% and as Facebook grows and matures, I do adjust the cost of capital down to 8%. 6. Cash and Debt: The assumptions above are sufficient to estimate the value of the operating assets. Discounting the cash flows back at the cost of capital (with changes over time) results in a value of $71,240 million. To get to equity value, I subtract out the outstanding debt ($1,174 million) and add the current cash balance ($1,512 million). While I would normally augment the cash balance with any cash proceeds from the IPO, Facebook is open about the fact (See S1, page 7) that the proceeds will be going to Mark Zuckerberg to cover tax expenses from option exercise and will not be coming to the firm. Note that the median value of $ 70 billion is close to the base case estimate (as it should) but there is a 10% chance that the value could be greater than $ 117 billion and a 10% chance of a value of $ 43 billion or less. b. Restricted Stock Units: In the last few years, Facebook (like many other tech companies) has shifted to granting restricted stock units. These are regular shares but the holders who receive have to first stay long enough with the company (vest) to lay claim to them and often face restrictions on trading. The liquidity restrictions, in particular, should make these shares less valuable than regular shares. There are 380.719 millions class B shares, in restricted stock units, that will eventually become regular shares and I will add them to current shards outstanding. c. Class A and Class B shares: After the IPO, there will be 117.097 million Class A shares (with one voting right per share) and 1758.902 million Class B shares (with ten voting rights per share). Other things remaining equal, the latter should trade at a premium on the former, though I don't think that the expected value of control in this company is significant. 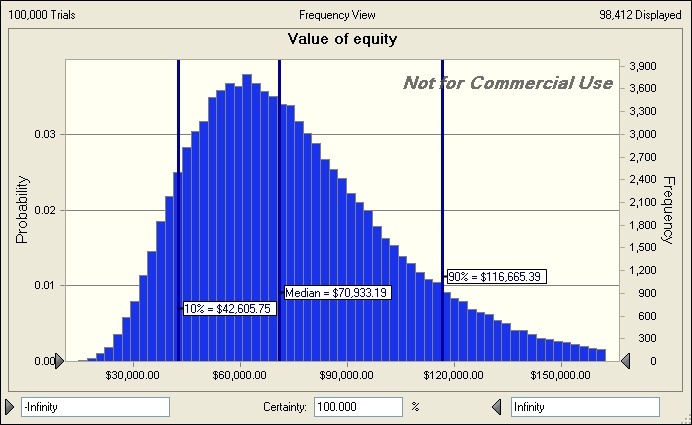 If I take the equity value, net of the value of options, and divide by the total number of class A, class B and RSU shares outstanding, the value per share that I get is $29.05. Allowing for a slight discount (3-5%) on the non-voting shares, I would anticipate that the class A shares in the IPO will have a value of about $28 (assuming that my share count is right... I will wait to get a firmer update as we get closer to the offering, before I close in on a per share value). You can access the excel spreadsheet with the numbers by clicking here. If you don't like my inputs or assumptions, don't stew about them. Go in and change them and see what you get as the aggregate value of equity in Facebook. If you can post it in the Google spreadsheet that I have created for this purpose, even better... Let's see if we can get a consensus value for the company. If you are investing in Facebook, give credit to the company for being upfront and honest about where the power rests in this company. On page 20 of the filing, you will find this "Mr. Zuckerberg has the ability to control the outcome of matters submitted to our stockholders for approval, including the election of directors and any merger, consolidation, or sale of all or substantially all of our assets. In addition, Mr. Zuckerberg has the ability to control the management and affairs of our company as a result of his position as our CEO and his ability to control the election of our directors. Additionally, in the event that Mr. Zuckerberg controls our company at the time of his death, control may be transferred to a person or entity that he designates as his successor." A little later on page 31, you will find this "We have elected to take advantage of the “controlled company” exemption to the corporate governance rules for publicly listed companies. Because we qualify as a “controlled company” under the corporate governance rules for publicly-listed companies, we are not required to have a majority of our board of directors be independent, nor are we required to have a compensation committee or an independent nominating function." Let's be clear about this: this is Mark Zuckerberg's company and you and I are just providing him with capital. For those of you who are familiar with my valuations of Linkedin and Groupon, you will note that I am more positive about Facebook than those companies. Part of that can be attributed to Facebook being further along in developing a business model that works and delivers profits. Another reason, though, is that Facebook has a real chance at being the next “winner take all” company. What am I talking about? In conventional businesses, a company that gets a large portion of the market is subject to competitive assaults that cap the market share and reduce profitability over time. In some parts of the technology business, controlling a large share of a market seems to give the winner the capacity to take over the whole market. Consider three big winners from the last 30 years. Microsoft started off in the “office suites’ competing with many players in the word processing, spreadsheet and presentation program businesses, but at some point, its dominance drove the competition out. To a lesser extent, Amazon’s dominance of online retailing and Google’s ownership of online advertising (so far) reflect similar “winner take all” phenomena. I am not suggesting that Facebook has a lock on social media advertising, but it has a chance to get a big chunk of it, and if it does, the value that I estimated will be too low. Note that the simulation does yield values of $120 billion or higher for the company, if the stars align. Would I buy Facebook stock, if its equity were valued at $75 billion? No, and not because I believe that the price is outlandish, but for two other reasons. The first is that the price reflects the expectation that Facebook will become a phenomenal success. Anything less than superlative will be viewed as a failure. In closing, Facebook has immense promise as a company and it is being priced on the premise that the promise will be delivered. Could it be worth $ 100 billion? Sure, but you are fighting the odds as an investor. Social media companies today collectively and Facebook in particular resemble stores with tremendous foot traffic (850 million users in the case of Facebook) but with nothing on the shelves. You are buying access to the foot traffic and hoping that you can get something on the shelves that they will stop and look at and buy. Given that social media is still in its infancy, we really don't know whether this promise will pan out, and that remains the basis for the uncertainty, and why short cuts that are based on value per member (a metric that I see with social media companies all the time) are fraught with danger. In the graph, I see that 100,000 trials were run but only 98,412 were displayed. Where are the other 1,588 -- more toward the $5B range or up around $200B? Assuming I'm interpreting that correctly, it seems worth considering given some of the infamous examples we've seen that started off with charts like this one. Thanks for the great read. Great review and valuation of Facebook. My only question: how did you test the distribution of possible equity values? Why don't you add a premium/discount to the control that Zuckerberg has on the company? I m thinking something in line with the values of illiquidity discount could apply here. I am not sure the valuation would be justified....but I agree with your conclusion. Second, I use a Monte Carlo simulation, where I define distributions for key variables to get the distribution of equity values. Is the scale wrong on the Goog/Apple chart? I think that should be millions. Yikes... You are right. Fixed now. You seem to completely ignore FB's non-advertising revenues, i.e. in-game purchases and the potential these hold as a sustainable future revenue stream? In any event, I find it funny (yet understandable) that you are constantly apologizing for being "too conservative". I find your growth projections over the next decade to be very far from conservative, when we consider that FB has already hit 850MM users (and in fact were planning on hitting a billion many months ago, but failed). In fact, I would argue that your growth projections in essence imply that FB is the "winner take all" and anything short of that will not land them at a $70B. Just my 2 cents. Shouldn't you have taken into account the numbers of users which is about 800 millions, compared to the number of potential customers? It seems facebook has little chance of profit in China (already taken by a Facebook knockoff), russia (same), and I guess atleast some of africa. This doesn't really leave this much room, so how will revenues grow tenfold in the next few years? Is it reasonale to expect a huge rise in the value per customer? On the year 2000, the entire world of internet users had less than half the users facebook has today, and the growth in internet users was eighttold in 10 years. this simply cannot happen again, and I wonder how one would add this to such model. One of you thinks I am under estimating revenues and the other that I am over estimating revenues. That is precisely why I left the spreadsheet as an open one. So, go in and make your own estimates. You may very well decide that Facebook is a buy at $ 100 billion. I personally think that the number of users is a distraction. Remember that 10% of the users account for 80% of the posts and that selling them stuff (other than fake cows for fake farms) is not going to be easy. In fact, I am pretty sure that if the growth comes from those sources, the operating margins will be much narrower. Actually, I think we are both saying that the growth assumptions are too aggressive and the valuation unjustified. But as you point out, its all a matter of opinion... Interesting analysis in any event. This is exactly the conversation that we should be having, about whether the number of users has leveled off, where Facebook will get its revenues from and how profitable that business will be. Instead, what I wager you will see in the IPO valuation is a relative valuation where Facebook is valued at $ 100/member and passed off as cheap because you paid $250/member for Groupon and $ 400/member for Linkedin. So, I am serious. Given your views on user growth and where Facebook will get its revenues, make your best judgment of revenue growth and margins. And value the company... It will add to the conversation. Thanks Professor. Would you be able to comment on the mean and standard deviations that you use for each variable in the simulations? What was you criteria to choose them? For revenue growth, I made Google my frame of reference, with the range from one half of Google's revenues in ten years to twice Google's revenues in ten years. For the margins, I looked at the cross sectional distribution of pre-tax operating margins of successful technology companies and used a uniform distribution. For cost of capital, I used the range of cost of capital that I have for all US companies and set the range from the median to the 95th percentile. Very good analysis, it's easy to get used to your excellent posts!! I specially like your "open-source" approach, being transparent in all the assumptions and providing everyone with all the tools to change them as they wish. I think you are setting an example in both the education and the investment banking industry! very nice analysis. I did something similar couple of weeks back and it came out as follows..
facebook needs a consistent year over year growth of 50% for 10 years to justify 100B. Possible? maybe if China opens up to Facebook. Current revenue per member (value generated by each of the 850 mil) is about $5 and that needs to improve to $120. big task! What about D&A? Lots of capex assumptions with no FCFF tax benefits of D&A. Reinvestment in net cap ex, which is the difference between cap ex and depreciation. So, the tax benefit of depreciation is being counted in the cash flow. Looking at the S-1 filling the company says that the issue proceeds of the IPO shall not be invested in operating assets but in non-operating assets , so the return on Equity shall go down eventually shouldnt we use a discount premium for the same. The issue proceeds will go to the founders and will not stay in the firm. If it had, it would just have been added to cash. The ROE effect on the overall firm, if it had done so, would have been irrelevant because we are valuing the operating asset separately from the cash. As always great analysis and the valuation looks not unreasonable given current numbers and where two comparable firms Google and Amazon are now with around $ 40 billion in revenues after around 10 to 15 years in existence. My own two cents is 'IF' Facebook succeeds it will look like a combination of Google and Amazon as I think the existing platform can be leveraged for direct eCommerce so revenues can grow more than the projected 40% though the downside to eCommerce is I think margins will come down. While I can access the excel spreadsheet I am unable to access the google spreadsheet. I get the message 'you don't have permission to access this item. You can request access from the owner'. Professor, it would make no sense NOT to buy at the IPO price ($75 -$100 billion), if able to, for the simple fact that you'd be selling higher the very same day. This is a near-certainty from past behavior, and very few investments share this same characteristic. 800 million users but the crowd turns in 5 mins .. as brutus found out after the death of caesar. personally i valued it at 50-60 billion and that too with operating margins which i really don't think are possible , Google has youtube which i think if valued alone would give facebook a run for its money, leave along the search business. Sir, excellent post as usual. Just wanted to talk about how people seem to predicting for the last 1-2year the repeat of the dot com bubble. Since so many people across the world are talking about the same thing, i am sure this would not end up as a bubble. Currently only market leaders in the internet industry are getting the so called crazy valuations. It's not for stupidity that Warrent Buffet does not like technology companies. Given his investment style, had he invested in Nokia/RIM for alife time... he would not have been too happy with his investments. Professor, thank you for your valuation. I agree entirely; the 75-100B number is justifiable, but there is just so much risk inherent in this industry. I struggle to see where they will continue to find new customers. Without some sort of paradigm shift where people start executing more transactions through the site, I fear this stock will "mature" quickly. fantastic analysis and great review! in my master thesis for my MBA (finished in december - before the S1-filing) I took another approach to calculate fb's value: basically I looked at the online advertising markets in the biggest economies worldwide and made the assumption that a certain reach (i.e. number of internet users registered on fb) implies a certain share of the online ad market. the more users are registered on fb, the more ads will be sold -based on relation of users and market-share of the last 4 years. Basically I looked on how much fb can earn with online advertising, since this ressource is limited, but still it's biggest driver. but anyway, the whole point in the high facebook valuation is not what fb earns now, but what fb MIGHT earn in the future - not with ads, but with the tecniques (and the implied user data) it MAY develop. another reason for the high fb valuation is based on the partecipants on this price rally: "social media experts", banks, investors... they all do have a lot of interest in pushing fb's valuation (as Prof.Damodaran pointed out in early posts on Goldman Sachs Investment in fb). Interesting analysis. Strictly as a social networking company, I don't think Facebook justifies a $100 billion dollar valuation. The key to understanding why Facebook is worth this much is to understand that their potential is really in search, ecommerce, identity services, entertainment, and other vast business domains. Facebook has a legitimate shot of competing in search by using their incredible collection of social data to fuel their search experience. Facebook has captured the attention of the popular culture in addition to businesses: look at how many active users Facebook has, look at how many big brands are promoting their Facebook pages in their TV commercials, look at how many companies their are at BuyFacebookFansReviews that do nothing other than promote Facebook pages...Facebook is really on the right track here even if they deserve a bit of criticism over some of their features. I think that the reason that Facebook is worth well in excess of their $100 billion IPO is that they have the potential to dominate search, ecommerce, and other major fields. But this market is so big and valuable that I think there's room for other players to get involved here and take some risks and chances that big companies like Facebook and Google won't take. This is late, but hopefully you'll respond. I'm not sure I understand the reinvestment aspect of this, particularly the timing. You say that in your model, the firm generates $1.5 million of revenues for each $1 million of additional reinvestment. But that doesn't seem to match up to how your spreadsheet works. Your spreadsheet seems to generate $2.10 of incremental revenue for every $1 in reinvestment. 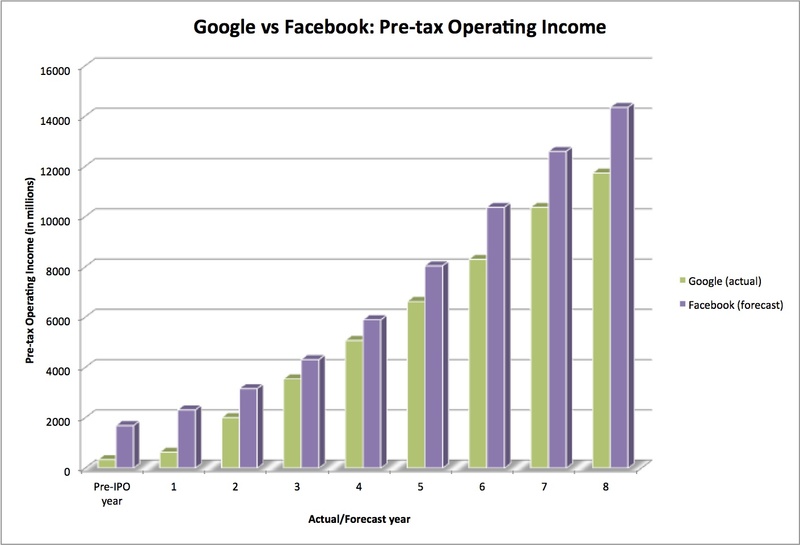 For example, in Year 1, Facebook generates (in expectation) $1,506.40 in after-tax operating income, based on $5,195.40 in revenues. How much of that does it need to reinvest in order to generate the $2,078.16 growth in revenue (7,273.56-5,195.4)? I'd say it should, in year 1, reinvest $1,385.4 to generate that incremental income. But you have Facebook reinvesting $989.60 in Year 1 to generate that additional growth. Could you provide some intuition for why you model reinvestment of Year X's operating income as generating Year X's incremental revenue? That doesn't seem possible, especially if you assume that all cash flows happen at year end, which I think is more or less what your model does. Work with changes in revenues each year and you should get the reinvestment. Year 2 revenue is $7,274, which is $2,078 more than in Year 1. We both agree that Facebook needs to reinvest $1,385 to generate this additional revenue. But the question is when does that reinvestment occur, or, when does Free Cash Flow reflect the reinvestment?. My argument is that you need to reinvest money at the end of Year 1 in order to generate revenues in Year 2. So the $1,385 reinvestment should be coming out of Year 1's Operating Income to get to Free Cash Flow. I'd say that Year 1 Free Cash Flow should be the $1,506 of After-Tax OI less the $1,385 of reinvestment, or $121. It doesn't seem logically consistent to assume that cash flows occur at the end of year, but they can be used to generate revenues for that year. I agree with the comments that Facebook might be worth more (or at least a more attractive investment, which should mean worth more) if the investors other than Zuck were able to have input on how to run the company. Leaving the fate of the Company in one person is scary to me. If Zuck dies, who takes over control and decision making? seems like a big risk. I added in 5% failure risk for that type of possibility. I am unable to access the Google spreadsheet. I get the message 'you don't have permission to access this item. You can request access from the owner'. Can you let me know how I can gain access? The Google spreadsheet seems to shut access down randomly even though I have set it for global access and edit. I have changed it back. I hope it is accessible now. Sorry! It looks like you were using crystal ball for your simulation. Can you also share which of these assumptions had the biggest impact on equity value? (revenue growth, operating margin, cost of capital and reinvestment). The tornado chart will do too. Yes, the google docs spreadsheet is open again. I was able to add to it. Revenue growth was the biggest determinant of value, with operating margin a close second. The two should probably be linked (you can set a correlation in Crystal Ball...), which would make for a tighter peak in the distribution. It makes perfect sense that revenue growth was the biggest determinant of value followed by operating margin. I thought lowering operating margins to 35% was too conservative given the scalability of the business. But having checked GOOG, MSFT, AAPL and EBAY (all below 38%-AAPL)it makes sense. I reviewed Facebook's S1 filing and it seems that they will be receiving cash from the IPO, contrary to what you assume on point 6. The S1 filing states there will be two sellers of Facebook stock in the IPO, Facebook itself and Mark Zuckerberg. Only Zuckerberg's own stock will be used to pay Zuckerberg's tax obligations, but Facebook's proceeds will become available cash. Am I reading something wrong? I will check the S1 again. It is entirely possible that I missed that part, though the effect on value will be minor. The cash that is flowing into the firm will then have to be added to the cash balance. "Given that social media is still in its infancy, we really don't know whether this promise will pan out, and that remains the basis for the uncertainty, and why short cuts that are based on value per member (a metric that I see with social media companies all the time) are fraught with danger." I'm clearly not bright enough to debate your math on the valuation of FB here. But I am a retail financial professional with 30 years experience and I would make two observations. First, there is an active market for FB shares prior to the ipo. Some pretty bright folks are paying a $100 Billion valuation for shares today. Second, of the 850 million or so retail users of FB that will be interested in buying shares, they aren't buying until the IPO. At the retail level, interest will be off the charts. In the first few days following the ipo there will be too many uninformed buyers and too few shares, the stock will get a ridiculous valuation. My guess is at least a 100% gain above the IPO pricing. And it could go higher in the short term. And until more shares come available via lockup expiration and fresh financial results are released, who's going to stop the appreciation? Jorge is correct about the proceeds of the offering. Your data should be updated to include the cash received. Are you talking about the section on page 34? This sounds like boiler plate language that shows up in every IPO prospectus. Given Facebook's planned offering for only a tiny portion of their outstanding stock and what they say on page 7, I am not sure that they will have proceeds left over. But I will update these numbers, once I have the exact number of shares and the offering price for these shares. Thank you for sharing your model. It's very generous! I agree with your concerns about uncertainty of FB future and tend to consider preliminary price range as overstated. However I'd better refrain from precise valuation because of lack of knowledge about social media industry. It will be interesting to know are you okay with the fact that terminal value gives 80% of the whole PV? I'd say it's strange because the expected revenue growth rate and EBIT margin in next 10 years are impressive. And the second question. Do you consider any political risk in FB business? I mean the prohibition of FB in some countries (ie China) that could limit FB perspectives in future. On the first question, you cannot avoid valuing companies where there is uncertainty. Remember that you are not alone in being uncertain about the future. As for the terminal value being 80% of value, that is exactly what you should expect with a high growth company, since you will make your money primarily from price appreciation. On the issue of political risk, it is one of many risks that Facebook faces and I am not even sure it makes the top three list. I've done my valuation and put the numbers in Goggle spreadsheet. I agreed with you intuitively that "Revenue growth was the biggest determinant of value, with operating margin a close second." But, i came to a surprising conclusion when playing with your AAPL valuation model (need a counselor). I found that the biggest driver of value was the cost of capital after 10 yrs, followed by operating margin and then cost of capital in the initial years. I dont have crystal ball and came to this conclusion when I adjusted all the inputs with a 10% increase/decrease. I came late to this article and just checked out the google spreadsheet. I thought it was kind of interesting that if you take the average of all the valuations in the spreadsheet, it comes to about $60b. And the market cap as of today is-- $60b. Beta of 1.5 used in your valuation model looks massive to me. You have mentioned in the comments that you have started with Industry average unlevered beta which still look pretty high. What am I missing? Does this not account for the fact that the users that are actually worth something to the company - Americans - are slowing dramatically in their growth? Sure, the company is posting a ton of user growth, but 40% growth for the next few years is extremely aggressive unless you think ARPU in North America and Europe is going to go through the roof from the video games and other such sales. Advertising alone isn't going to get you there - check the ad revenue per user compared to last year. It has barely moved. Sure, the company is growing leaps and bounds in Asia and RoW, but users there are barely worth anything, so giving the company much credit for them is silly. Do you have any inputs to get 40% revenue growth, or did you just use it based on past revenue growth? If it's the latter, I think you've made a big mistake. hey I have $3.95/Each for 11+ Facebook Ad Coupon Code! any one want to try? I really enjoyed your analysis of the Facebook's valuation. But I am complete novice with regards to finance.And I have a query. Any help with regards to my query will be appreciated. In the 10Q submitted by Facebook , the cash flow statement has a column where they are deducting Deferred tax income from operating income to get cash accrual for the year. Now as Deferred Income tax means that some tax that is due but not paid by the company, so cash does not flow out of the system, then why did it got subtracted instead of being added. Any help will be appreciated. Facebook is the perfect example of a public offering thats overhyped overrated over talked about over written about. This stock is a very good example of why public offerings usually make very bad investments. Sunglasses or sun glasses are a visual aid, variously termed spectacles or glasses, which feature lenses that are colored or darkened to prevent strong light from reaching the eyes. Many people find direct sunlight too bright to be comfortable, especially when reading from paper in direct sunlight. By what you hear on the financial news. You would think theirs just 3stocks that exsist. Google Apple and Facebook. What is your take on FB stock at present? Do you think, it is worth investing now leaving apart the issue of control in the firm? It has started earning revenues from mobile and tablets, the issue of early lock up and employees selling their shares is no more a guess now. A baby downstairs to the store to buy drinks. The shopkeeper gave him a bottle of, then the child says no money.buy rs goldThe shopkeeper is angrily threatened:"Don't have the money to your mother!" The child was frightened out of bottle caps are off the ground. Pick up a see: come again a bottle of! So the bottle cap, gave it to the owner, walked happily.buy wow goldLeave the owner to choose a suitable text book with a clueless look on his face. A few Guild Wars 2 Gold i deliver scouts? Talk with the scout inside Guild Battles Only two, it buttons anyone a lot more no cost specific zones in the region and you've got as a result a lot more Buy Diablo 3 Gold, attractions and in addition responsibilities.Exactly what are landscapes? On Facebook it’s pretty much about getting many likes and fan of your page so that you can reach a wider audience and get the level of product promotion that you want out there. One can easily utilize the Facebook to boost his advertises either by themselves or by using a 3rd party for increasing their likes, which can be done when you buy real Facebook fans, which has proven to be an effective an reliable way. Many people are using this service so as to increase their market audience and also recognition. This Facebook boosting service makes it so easy. I was looking for such type of software and after reading this post I am very happy. Thanks blogger! Skype Support and Call +1-800-231-4635 USA (Toll Free). I was wondering if you could describe your CB assumptions on revenue growth, operating margin, cost of capital and reinvestment. Btw I know this is a late response but I was very curious to see how type of ex-ante analysis actually fairs. Thanks! Facebook: Playing the "IPO pop" game? Options and Taxes: Is a "Facebook" tax next?